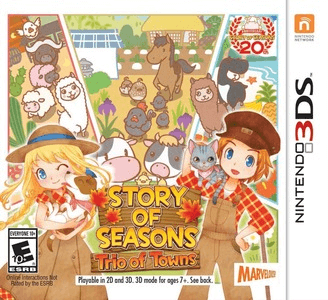 Story of Seasons: Trio of Towns is a farming simulation game developed by Marvelous for the Nintendo 3DS. In this installment, in addition to the usual farmland which the player owns, the player is able to visit three towns, each with their own distinct culture and lifestyles. Game is playable, and harvesting crops, tending to animals, etc. is all doable. No audio glitches have been found and all graphics are rendered with no problems.